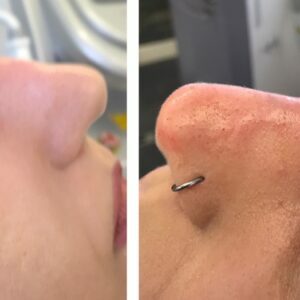 Nose job procedure using Dermal Fillers without the surgery! Arden Clinic offers the non surgical nose job also referred as the non surgical Rhinoplasty. This procedure is becoming increasingly popular with patients opting to undergo less invasive treatments without compromising a result. This intricate procedure is only performed by highly qualified and experienced Medical professionals. This procedure is an alternative to cosmetic surgery with very little downtime and minimal pain. Patients may return back to their daily lives same day as procedure. The procedure is perfect for a crooked, hook shape, bumpy or droopy nose. The procedure can be administered to rebalance, resize or refine. We use a wide range of injectables such as Restylane, Juvéderm & Radiesse. How long does it take to do the procedure? The procedure takes around 20 minutes however we suggest you schedule 1 hour for your appointment for the consultation and any questions you may have. Who will carry the treatment out? The procedure is administered by a medical professional who is highly qualified and experienced. Will I be awake throughout the procedure? Yes, you are awake during the procedure. There is minimal discomfort and no anaesthetic is required. 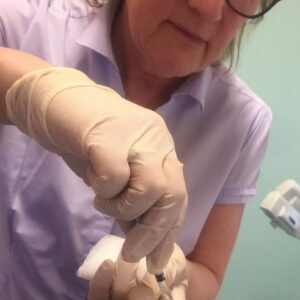 The Dermal Filler contains Lidocaine to minimise patient discomfort. The effects will depend on your age, lifestyle and skin structure however will normally last between 6-12 months. This procedure can be repeated to maintain your result.